What do we have here? 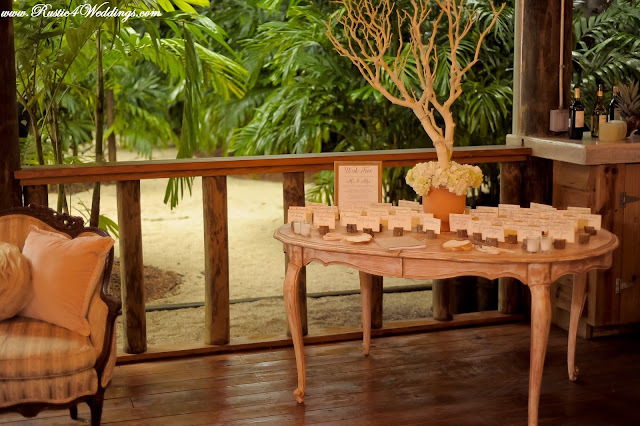 Adorable candy buffet labels propped up on rustic card holders. Oh where, Oh where can you get these? From us of course! 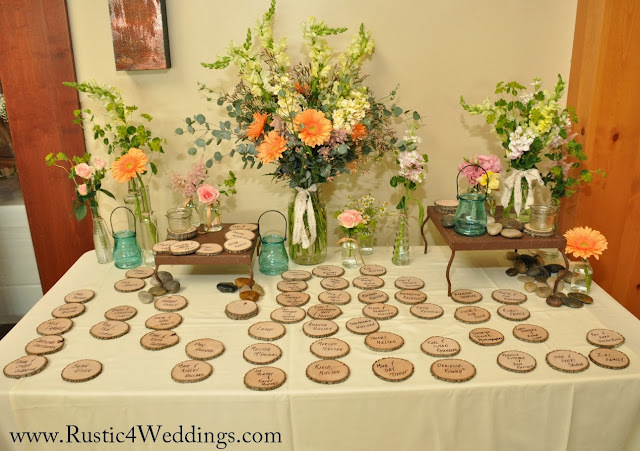 We sell the rustic wooden place card holders in our Etsy shop! 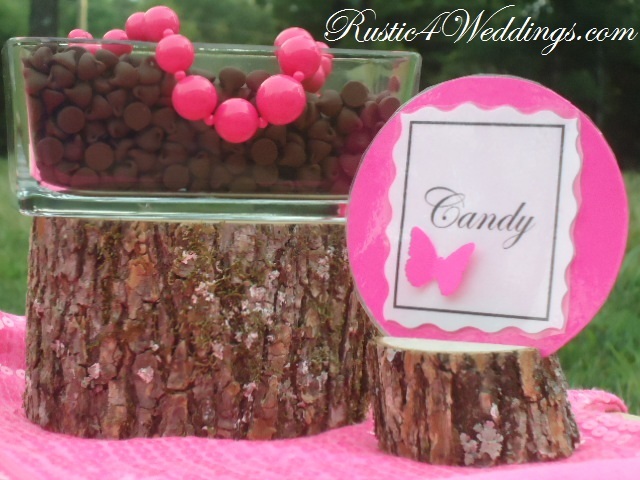 I made the most adorable little hot pink butterfly candy buffet labels. They turned out pretty cute! 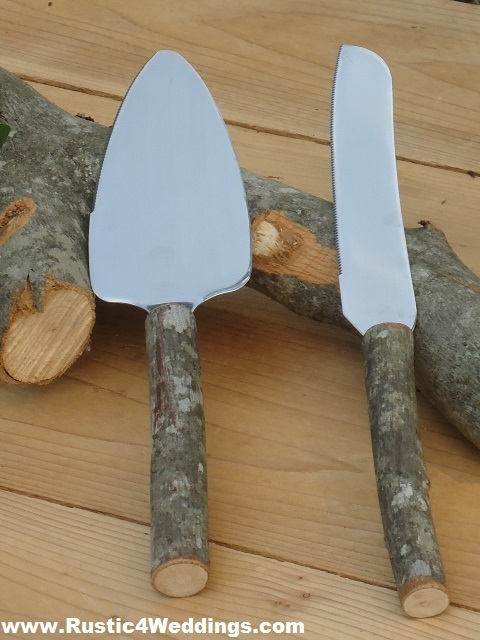 How did I make these... you ask? Well, I dug around in my craft pile, that needs some severe organization, and ran across my paper cutter punch deals that my mother in law gave me. Actually, if you want to get technical the butterfly one I used was called "Martha Stewart Classic Butterfly Medium Craft Punch". 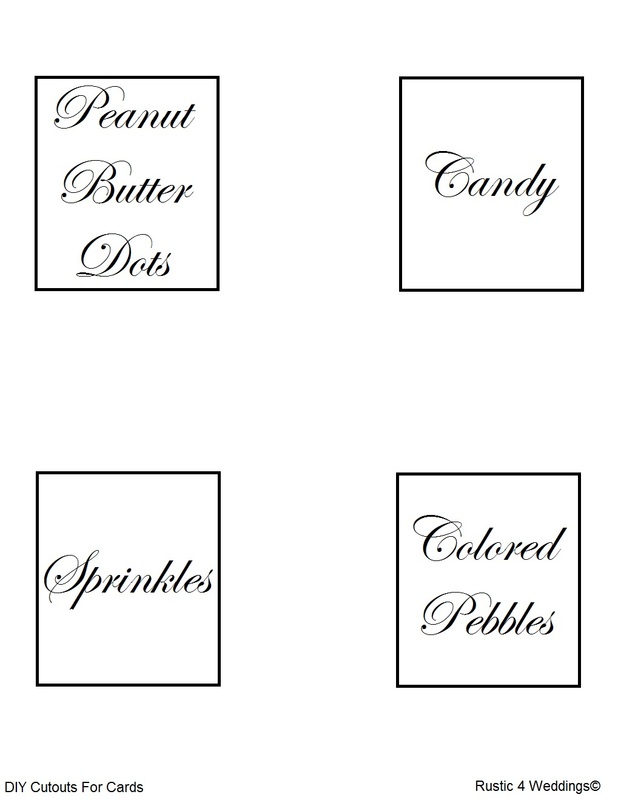 The butterfly craft punch creates a crisp, perfectly shaped cutout that is great for decorating and in this case, making your own candy buffet labels. Okay let's back it up for a second.....First your going to need something to stick the little cute butterfly to. 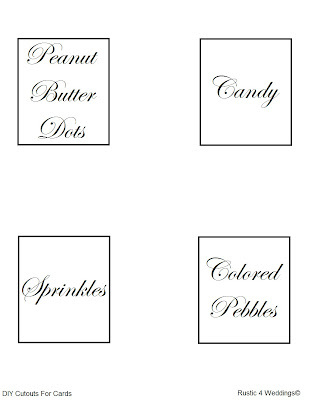 I got into my Paint program and just drew a quick template out with the words, "Candy", "Peanut Butter Dots", "Colored Pebbles", and "Sprinkles". I printed that out and cut the little sayings out using decorative cutting scissors. I then used my large circle punch and cut a large circle out of the hot pink paper. Here is the template I made. You can use it if you want. Just Save Image As and then open the sheet up in your Paint Program on your computer. Then just change the words out to fit what you need. Or better yet, make your own creative catchy template in an Adobe program if you have one. 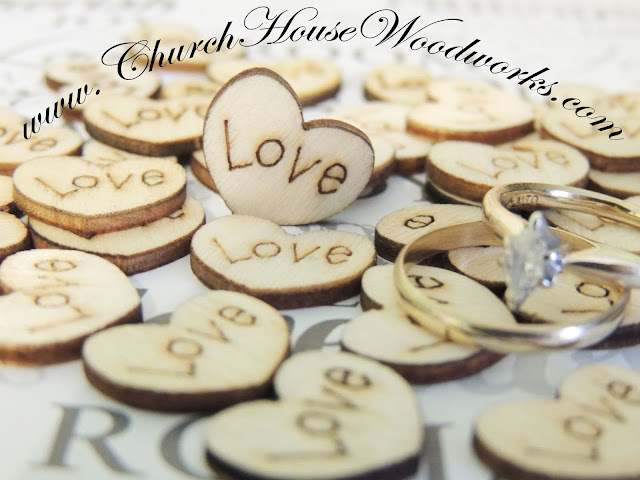 There are lot's of free printables online, you just have to look for them. 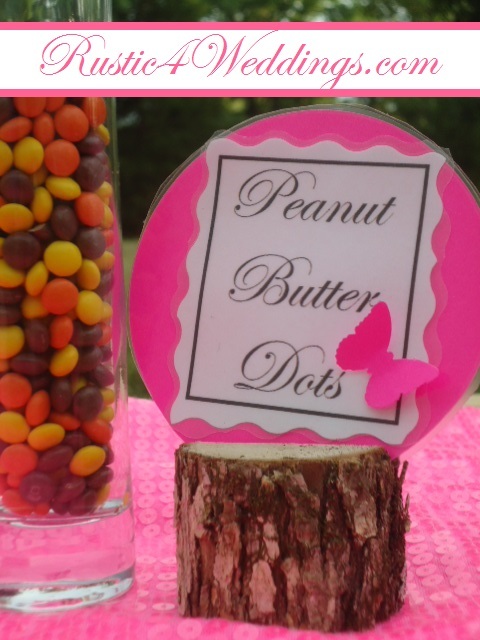 I decided to get really creative and I laminated the large pink circle and white candy labels. 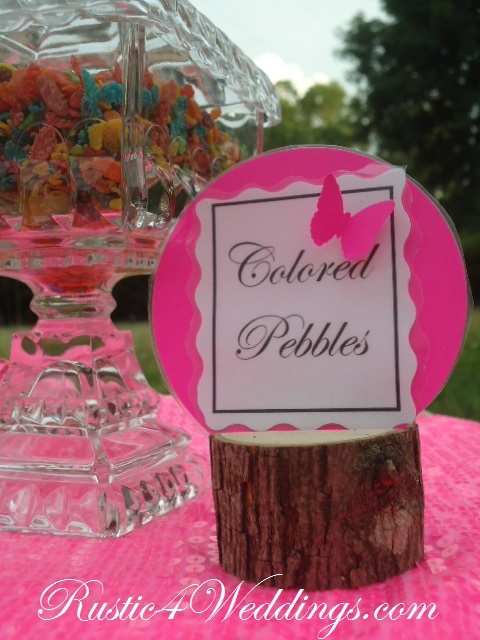 I just taped the white candy labels onto the pink circle background. Then I added the tiny 3d butterfly to the label and just used tape to attach it. That's it! 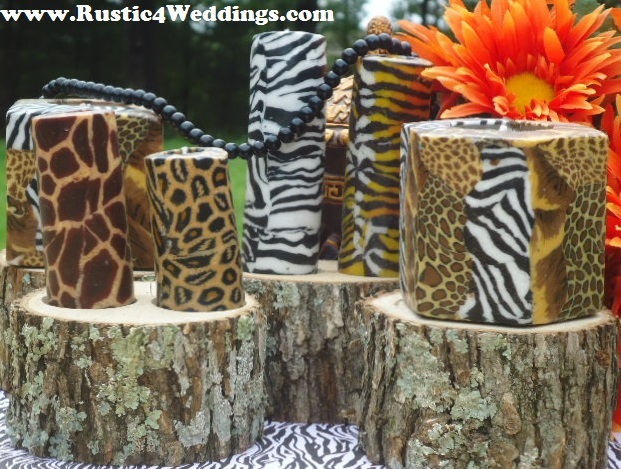 I just stuck the label down into the rustic wood holders and that was it. 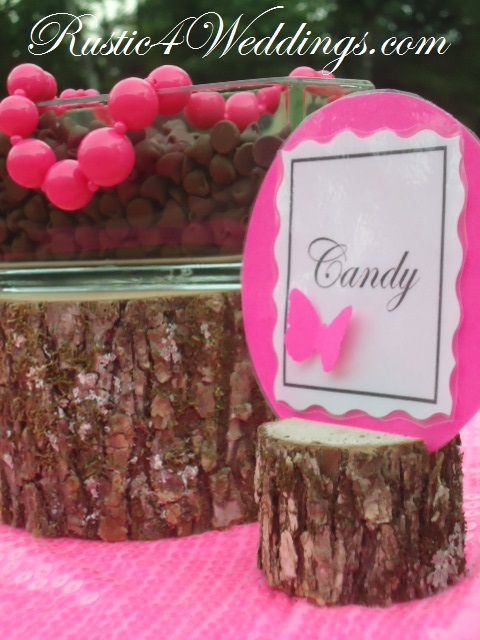 And that is how I made the Hot Pink Candy Buffet Label! 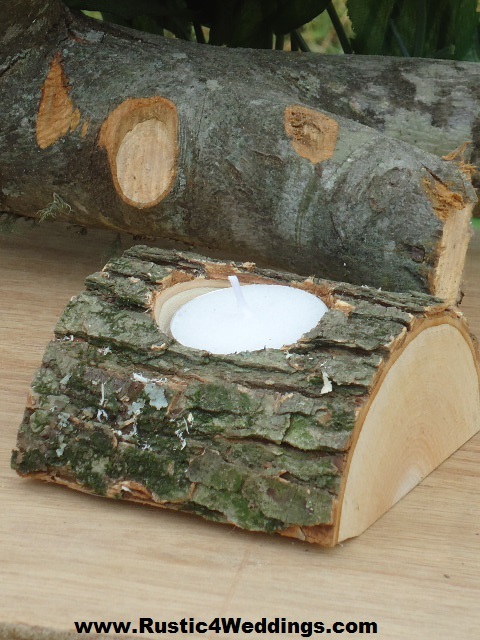 You can DIY with lot's of different styles. There are so many different paper punches on the market to choose from. 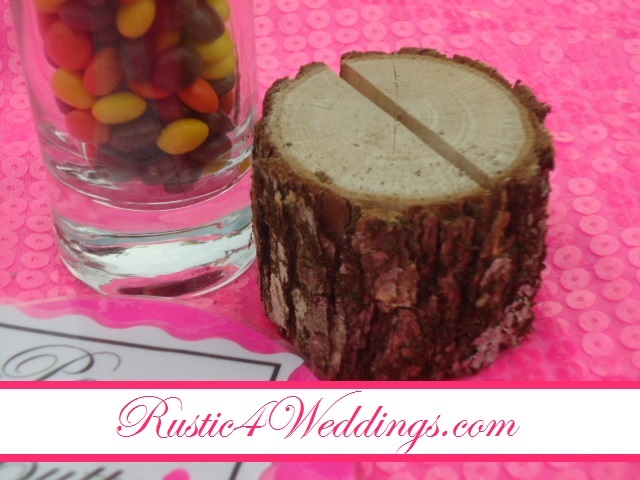 We do offer the rustic wood place card holders for you to buy so you can feature them in your Wedding Candy Buffet. You could use these for other events as well. 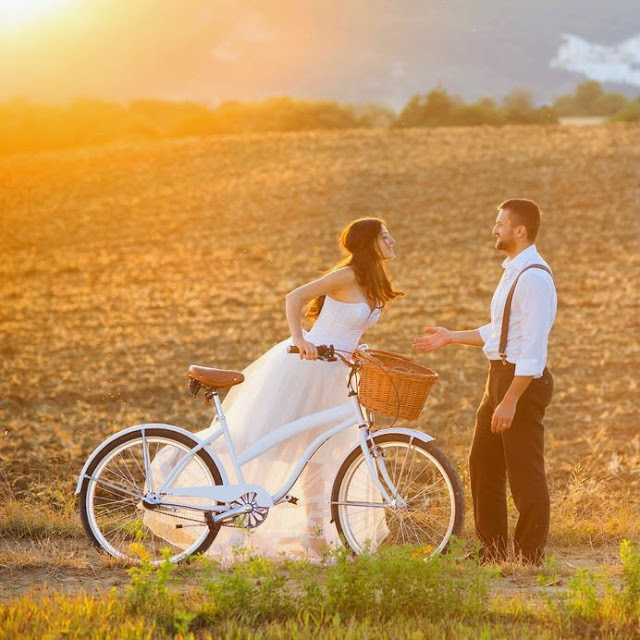 It doesn't have to be a wedding theme. 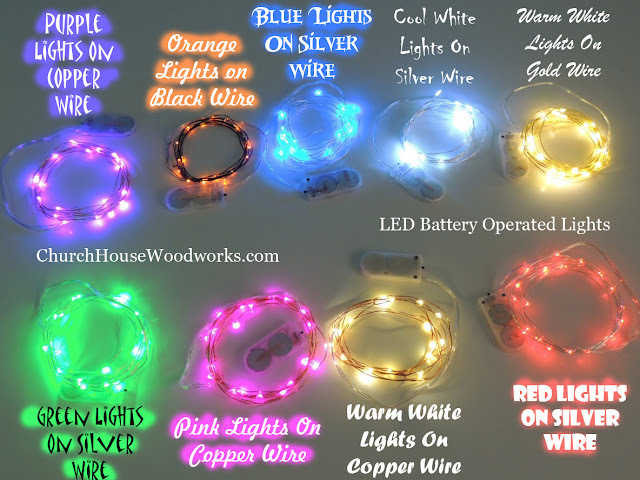 We offer different quantities so look around in our store and find what you need. 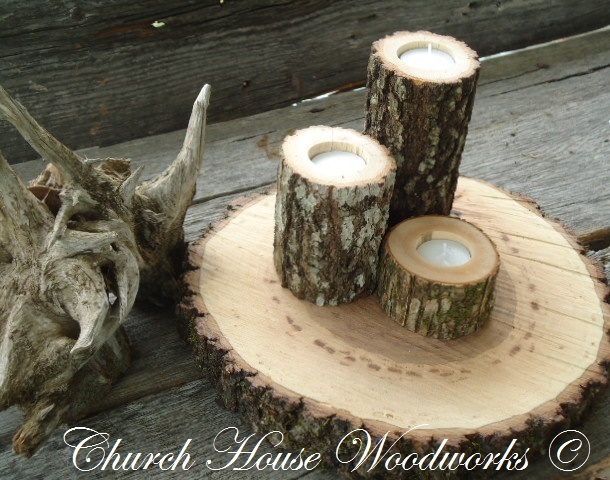 We do custom orders as well. This picture has Hershey chocolate chips in a glass container that's dripping with pretty pink beads. 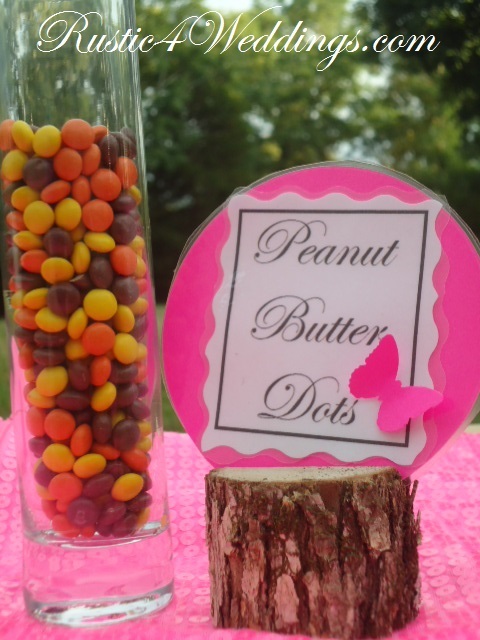 The beads were just an idea to give the candy a pop of color. 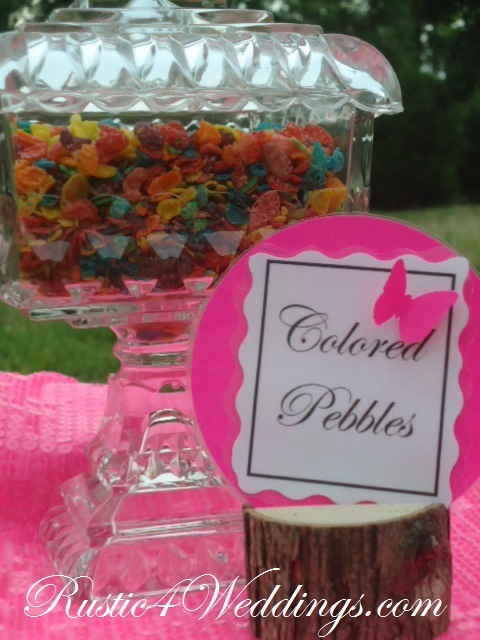 The "Colored Pebbles" were Fruity Pebbles cereal and the "Peanut Butter Dots" were Miniature Reece's Pieces. 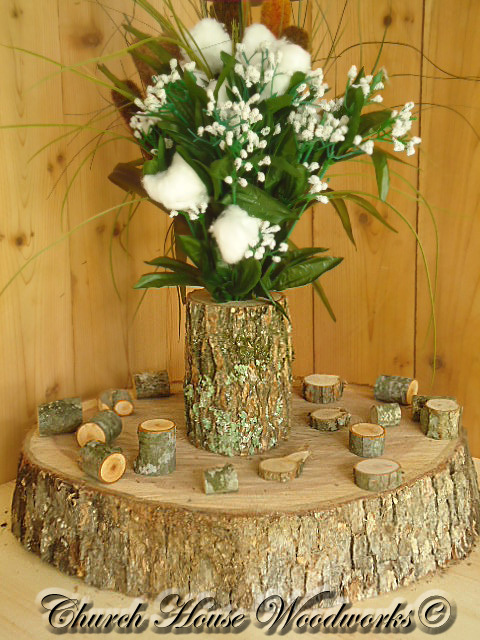 Go to our store so you can start shopping for your event now!